Twitter began warning its users in the West about content they post that violates Pakistan law. Jamie Glazov, a Russian-born Canadian columnist, explained the situation on his online talk show, The Glazov Gang. Glazov explained that the alleged violations goes against Pakistan’s penal code that carries a potential sentence of life in prison or death. Glazov then went on to joke about canceling his book tour and vacation in Pakistan. 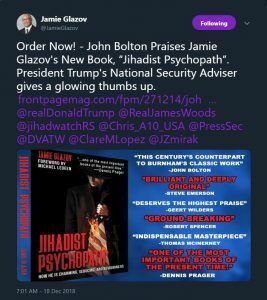 Glazov posted a message about pre-orders for “Jihadist Psychopath” that included an image of the book and glowing praise from several well-known figures, including Trump’s National Security Adviser John Bolton. Glazov’s new book, “Jihadist Psychopath,” warns about radical Islam infiltrating western culture and western values. The book breaks down how radical Islamists seduce and recruit others to carry out terrorist attacks. The Twitter warning is a frighting and disturbing example of what Glazov’s book is talking about. Facebook, Twitter and Google are anti-Trump. Along with the mainstream media ‘Fake News’, they are controlling what people see and what will influence them.